Posted on 12 August 2016. OPPOSITION UPND cadres accompanying HH caused confusion at Kabulonga Boys polling station where their leader Hakainde Hichilema cast his vote, after word went round that one electoral official was a PF cadre. 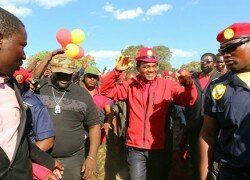 It took Mr Hichilema and other senior UPND officials to calm the cadres who harassed and wanted to beat the official who was supervising the election. They demanded that the official be removed from the polling station to avoid more confusion, claiming that the officer was a PF supporter. The electoral official, only identified as Mr Chibwembe, was accused of having been one of the PF ring leaders who stoned and attacked the UPND supporters in Mtendere township earlier this week. And Mr Hichilema said his party would launch a complaint about the official to the Electoral Commission of Zambia. Mr Hichilema said the Zambian people expected a free, fair and transparent election, saying it was unacceptable for any party official to be part of the electoral process during voting. Mr Hichilema said Zambians would make decisive decisions and that whoever would carry the day so be it provided the process was transparent. “The Zambian people will decide the leadership they want today, and there is no issue whoever wins in a transparent manner, so be it,” he said. He said that it would not be fair if the electoral body allowed political cadres to run the election, as such was a recipe for confusion. And Kabulonga Boys presiding officer Dennis Chikompa said he could not comment on the matter and referred all queries to ECZ. Mr Chikompa said the polling station was opened at exactly 06:00 hours and that more than half of the registered voters had cast their votes by afternoon. He said the election was characterized by a high turnout.